Divergent star, Shailene Woodley, chopped her locks for an upcoming role in 'The Fault in our Stars'. This is something near and dear to my heart. My daughter, who is currently ten years old. Has chopped and donated her hair twice already. It started when she came with me one day to donate blood. She asked a lot of questions about why I did it and saw drawings on thank-you cards from sick kids and asked if she could help. I explained she was too young to donate blood, but that she could when she was older if she wanted. d to do it and so we went to the hair salon and chopped her hair. It grew pretty quickly and two years later, she donated it again, cutting it even shorter to ensure there was enough length to donate. My daughter in 2010 and 2012 when she chopped her hair to donate. It's already grown to shoulder length again now. Hello! your daughter is so cute! 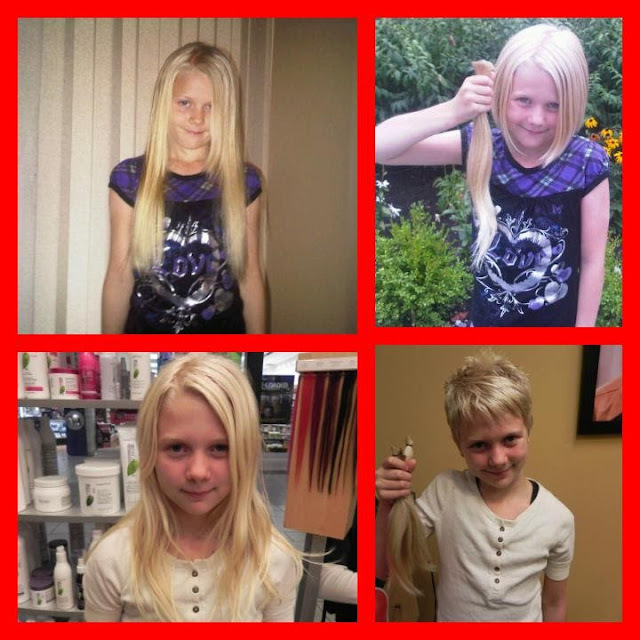 my daughter donated her hair back in 2008 to pantene (which takes 8") since her hair wasn't long enough for locks of love (minimum 12"). i love that little pixie cut! my daughter is now 12, but will turn 13 next week. she's currently reading Divergent and really enjoyed The Fault in Our Stars.